The Sleep Philosophy plush weighted blanket is a safe and effective remedy for anyone looking for a better night's sleep or just to feel a little more relaxed after a stressful day at the office. The 60 inches x 70 inches blanket distributes pressure all over your body, touching pressure points that can help you reduce stress and anxiety. At the same time it creates a feeling of being held or hugged to make you feel secure and relaxed. There are 10 inside ties to hold box sewn poly fill and glass beads insert. Using a weighted blanket can help relaxing user's mind and in term to promote a deep and restful sleep throughout the night. This blanket can be used in many different ways by covering your whole body for sleep or simply wrap it around your shoulders or lay it across your lap or legs. Choose a blanket that's around 10-percent of your body weight, available in 12 or 18 pound size. No need to stress about cleaning the blanket, the 100-percent polyester plush cover with zipper closure is machine washable. This is an amazing blanket! I was unsure which of these blankets to buy, there are so many available but not all of them actually have the weighted filling. This one had the most information on its page and it is competitively priced so I bought it. I’m so glad I picked this blanket, it is everything that it’s described to be and more. I feel calm and soothed each time I use it. The plush is so soft and the size is perfect for use while I’m sleeping or just lounging around the house. I love that the cover is removable and the little ties inside make sure the insert doesn’t move around. The weight has been perfectly distributed evenly around my body each time I use it. I read another review that the weight shifted around but I have not had any problems with the weight being heavy on either side or around my feet. I love everything about this blanket it’s so comfortable and relaxing, I’ll be buying these as gifts during the holidays for sure. This is a great weighted blanket. I bought the 12 pound and it was the perfect weight for me. The size was large enough for me to use while sleeping or to just put on my lap while watching TV. It's a great stress reliever for me and feels comforting too. I love that the fabric is super soft and plush and that you can easily remove the plush cover and throw it in the washer. There's ties on the inside so the blanket doesn't shift around. It's also constructed well so the beads don't fall down to your ankles and remain in place. They put a lot of thought into making this a great weighted blanket! Bonus-it also arrives super fast within 2 days! Dramatically improved my sleep quality. Noticeably reduced tossing and turning, and fewer times waking up in the middle of the night. I removed the plush duvet for now, but will likely put it on during the cold winter months. Will be purchasing another for family members. I ordered this 12 pound blanket after I had to return a different 18 pound blanket. The 12 pound weight is definitely much easier for this 165 lb female to sleep with and easier to move and lift. What I love most about this weighted blanket is the cover is washable and the super soft plush feel. It is very soft to the touch and feels nice on your skin. Seems to be high quality made. What I don't like about it is the noise it makes. The beads are very noisy and different from the other brand I had previously purchased. However, once you are settled the beads quite down and you don't notice any movement. Another thing is I feel this one is much cooler when you first cover up with it. I am not sure if it is the type of fabric or if it's the beads themselves but the blanket does warm up. I have wanted, compared and researched these blankets after learning about them from a therapist. My son has anxiety and I willing to try almost anything! He loves the blanket and says it honestly works. Says he sleeps better and moves it from bed to den cause he loves how comforting it is. . I will be investing in one for myself ASAP! I was concerned about the weight “over-heating” him but he says it doesn’t. Somehow the weight distribution swaddles instead of making him sweat. Highly recommend. I purchased the 12 lb and 18 lbs for my school age son (about 100 lbs) and myself. My son said that he is able to fall asleep a lot quicker than he used to, and I agree, too. 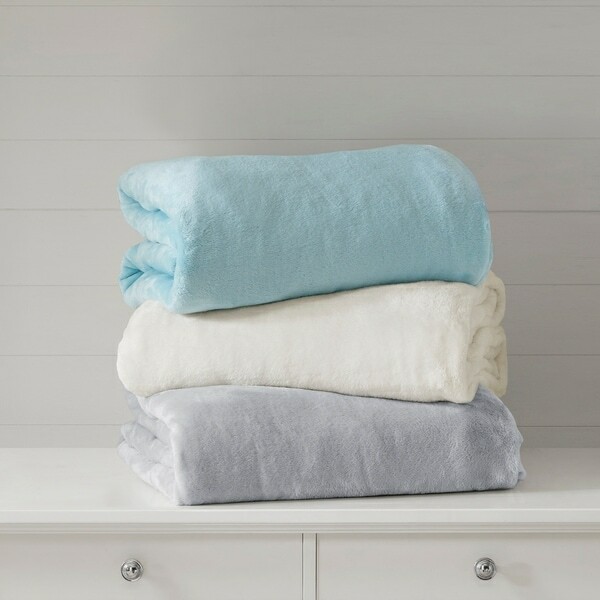 We love the plush soft and cozy feeling of the cover and the fact that we can wash the cover easily (as some other weighted blankets do not come with covers; you have to buy separately). The color and softness is nice and I am overall happy with the purchase. However, there are a few things I was not expecting and don’t particularly love about the blanket: it doesn’t fee as heavy as I expected it to so I fold it in half to get the desires weight. Also, you can hear the inner weights shift like a pouring sand sound when you fold the blanket. Since many of these blankets are filled with glass beads I was surprised by how light it was and the crunchy shifting noise that I looked all over the package and tag for information but couldn’t find it. Perhaps all of this is normal though, I’m not sure because it’s my first weighted blanket purchase. Got items for my daughter to help with her anxiety. The blanket has a very soft cover over it for easy cleaning. We got the smallest weight as my daughter is under 100 pounds but she says it's like a warm comforting hug, that helps her sleep. She has only used a couple of night but is very happy with it so far. If you considering a weighted blanket, this one is for you! Perfect size and weight for me (18 lbs), will be buying my wife the 12lb as soon as I'm done writing this review. My son loves this weighted blanket!!! This was such a good purchase at a great price! Highly recommended! Great item! This blanket is super cozy and helps me fall asleep at night. I researched weighted blankets and liked this one . It has proven worthy of the purchase price and description. Helps sleep. Blanket is very warm. Only thing I am disappointed about is it is too heavy for warmer months. I have recommended this blanket to many friends and family members. Love this blanket. My first night sleep was so sound, with no problems trying to fall asleep. Would recommend this all day long. heavy and fairly clunky, like a beanbag and the filling gets clumped up in corners, its very hot to try and sleep under but the weight is nice. Very comfortable but it tends to get really warm. Great price, removeable cover and free shipping. Grand children has Autism and the weight helps them, also I like the weighted blanket for myself. The weight helps me sleep better at night.